The dog’s going to the kennel. You stopped the newspapers. Everybody at your office knows you’re leaving — which is why they’ve been squeezing every last chore out of you. Perusing your list, you don’t see a whole lot that hasn’t already been addressed. Then you look up at the philodendron vining through your living room. You forgot all about your plants! What’s going to happen to them while you’re gone? A weekend away isn’t going to be an issue for your plants — indoor or outdoor. Water them before you go, and everything should be fine. If you forget, most plants will be okay anyway. Fresh seedlings subjected to intense heat and sunlight could be wiped out in a weekend. Other than that extreme example, most plants don’t need your involvement in their everyday existence. It’s really a matter of how long you’re going to be away. A weekend, even a long weekend, shouldn’t present any problems for your plants. But if you’re heading to one of America’s great destinations and you’ll be gone a week or more, then plant care is going to be an issue. For a week or two, your sub doesn’t even need to be a horticulturalist. They don’t have to care about your plants — they just need to water them. Enlist the help of a neighbor or friend, or hire a responsible kid looking for a job. Maybe they can bring in your mail, too, and feed the goldfish. Leave a short, simple note about which plant needs what and when it needs it. 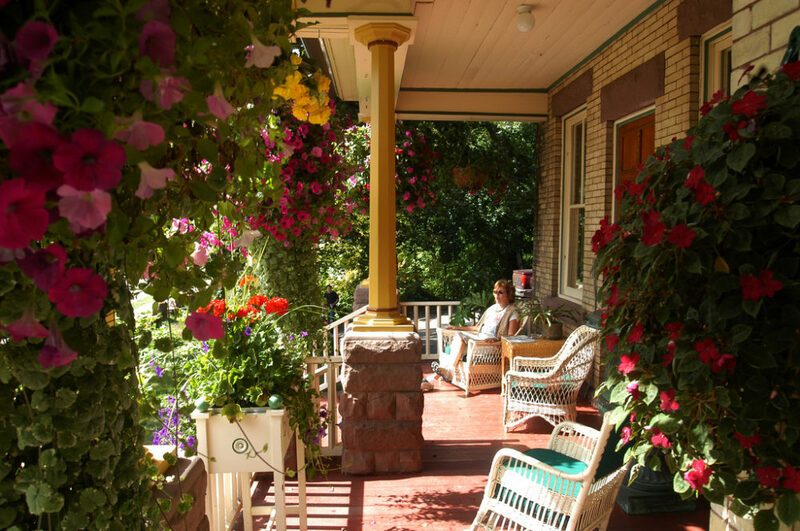 Depending on the duration of your trip, you may only need their help watering plants on vacation 2 or 3 times. No neighbor nosing through your house required. Self-watering systems are the best solution. You can even use them while you’re home, too. Many people have in-ground sprinkler systems to keep their lawns lush and green. If you have one and it reaches your plants, then you needn’t do anything further. 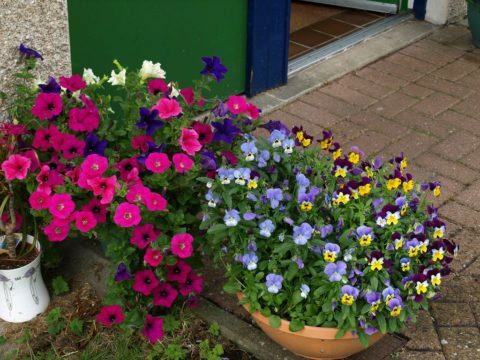 However, plants in hanging baskets take a beating from the sun, dry out quickly, and need to be watered daily. Take hanging baskets down and generously soak them. Place them within reach of a sprinkler head — preferably under the protection of a tree or someplace where they will be shaded. Do the same for your outdoor potted plants. If you don’t have a sprinkler system, then soak your outdoor plants and bring them into the garage. They won’t flourish in that environment, but they won’t suffer from overexposure to the sun combined with a lack of water. What if you don’t have automatic watering systems? What if you don’t have (or don’t want) someone coming to your home to water your plants? For outdoor plants, it’s simply a matter of watering them thoroughly before you leave and then giving them protection from the sun. They might not look as pretty after a week in the garage, but they will be alive. A few days of water and sun will perk them up. 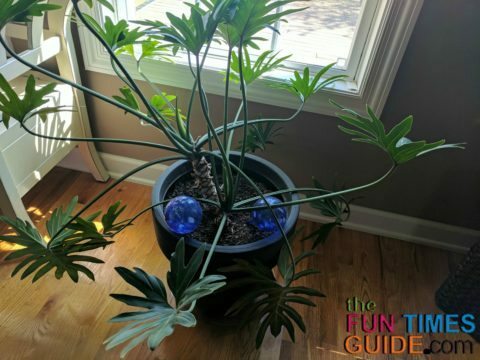 For indoor plants, there are a few tricks that will keep them healthy without the need for machines or daily intervention. Water your plants thoroughly. Tip a full, uncapped bottle of drinking water — or better yet, refill a used one from the recycle bin — and submerge it several inches under the soil. You can use this method indoors and outdoors. If you don’t like the look of the water bottles, you can purchase more beautiful and expensive glass globes that do the same thing. TIP: If you don’t water the plant first, the water will drain out quickly! Remember terrariums in grade school? A glass container would house several plants. A glass cover would keep the moisture in, and the plants would thrive almost independently. You could see it “raining” at times — as the water would drip back into the contained environment. The same thing can be accomplished with a large clear trash bag for your plants while you’re gone. Place a wet towel inside the plastic bag, and then insert your well-watered plants on top of the towel inside the bag. Pump or blow in air to seal the bag shut. Bind it with twine or rubber bands. Your plants will stink when you return, but they will be alive and healthy. You can do this for both indoor and outdoor plants. TIP: Just be sure to avoid the sun, or you may inadvertently bake them! Wicking water into the soil is a creative way to keep your plants happy. All you need is a vessel for the water (bottles, pans, bowls or buckets) and wicking material — which could come from string, yarn, rope or even old socks and t-shirts. Place the full container of water next to the plant or plants you want to water. Place one end of your chosen wick into the water and the other end into the soil of your plant, deep into the roots. As the soil dries, the wick will pull water into the roots. This is strictly an indoor solution. You could try it outside, but sunlight, wind, and evaporation may thwart your efforts. TIP: Test this before you go — to make sure it’s working properly! Some people can’t keep plants alive even when they’re home every day. But if you care about your plants enough to read how to keep them healthy while you’re gone, then you likely won’t have any problems before or after your vacation. Plants are resilient. They can endure a little hardship here and there. Your plants are lucky to have you. Enjoy your vacation and enjoy your plants when you return! I love writing about green living and sustainability on my blog: Living Life Green. I’m also a freelance writer, green living advocate, and environmentalist.